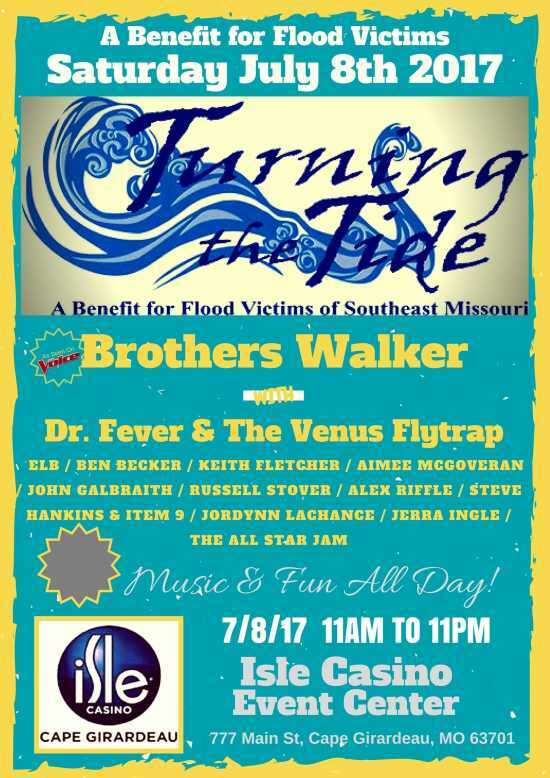 Brothers Walker (from The Voice) with Dr. Fever & The Venus Flytrap and guests at Turning the Tide Benefit at Isle Event Center in Cape Girardeau July 8th. Live Music All Day! A Benefit for Flood Victims in Missouri. Psychologists consider natural disasters like flooding as one of the most common causes of Post Traumatic Stress Disorder (PTSD). Flooding is particularly devastating to people because its effects are long term. When the water goes down, the fight is only just beginning. That’s the fight to save homes, and businesses, memories and dreams. Most of the time the water has washed all that away, and left in its wake is a combination of mud, dangerous waters, and mold that can never be gotten rid of, even if a structure survived the flood waters. Generally, it is all a total loss. And anything that is saved is often at great cost. A physical and psychological weariness will overtake even the strongest. Financially, it is ruinous. Many of the victims will not have flood insurance, and many more will not have contents insurance. And how do you even insure a memory? This is what Southern Missouri families are facing following the record-breaking floods of May, 2017. The American Red Cross and other help agencies may have helped provide food, shelter and medical care during the event, but soon those agencies move out, and people are left to deal with the disaster the best they can. Federal and state agencies will try to help, but the help is slow. Literally, families are left treading water for months at a time while their incomes, along with their homes and businesses, have been swept away. But that is where Southern Missouri shines, because we refuse to let our friends, neighbors and families members be swept away in the struggle to survive. Literally, Southern Missourians are “banding” together with a musical benefit designed to raise money to help those friends and neighbors in their struggle. On Saturday, July 8, Isle of Capri Casino in Cape Girardeau is hosting a 12-hour concert, featuring musicians from all over Missouri who are volunteering their time and talent to raise money for flood victims. It’s the biggest event the casino has ever sponsored, and it came about because of the concern of residents who were seeing the devastation of the flooding, both physical and psychological devastation. By the time the two of them left the Rodgers, it was pouring rain outside. A rain so hard it was difficult to see the road. But the two made it safely home. The next morning they got up and decided to go into Doniphan for lunch. Just as they were hitting town, they saw the flood waters already over the road into Doniphan. They took a detour route and got into town to get lunch. Inside the restaurant people were talking about how the Current River Bridge was being closed. Water was completely over it. Business owners were already filing into the restaurant with shock on their faces. Several of them already had water up to the ceilings of their businesses. It was evident there was going to be heavy loss from this flood of the Current River. Upstream at Van Buren, the devastation was possibly worse. Cabins were literally seen floating down river. The Landing, a popular vacation spot for many, was being torn apart by flood waters. “As I drove back to Columbia to work for the week, I could not get it out of my mind how devastating this was for my home area. With the tourism season just around the corner, I knew this is the type of thing that could literally wipe out communities all along these little rivers that flooded,” recalled Hilderbrand. “I felt bad that I couldn’t be there to help with the clean up, so I decided to do what I am good at….organizing!” she explained. The idea struck her to throw a musical benefit for the flood victims of Southern Missouri to help them get back on their feet. She quickly enlisted the help of many of her friends, and in particular, musicians that she knew. “I invited 16 bands to play. I didn’t even know yet where we would have the event. And I invited 16 because I thought several of them might say no, because of schedule conflicts. But it turns out, 13 out of the 16 said they were totally in. Hilderbrand enlisted the help of Cape Girardeau friend Michael Davis. The two of them started looking for a venue for the event. Because of the flooding, many Southern Missouri venues were still in recovery mode, so they could not be used. They decided to look for a location that could draw a lot of people to it. They talked to Isle of Capri Casino in Cape Girardeau, expecting to maybe get the use of a small stage. After hearing about the disaster and the number of families and businesses affected, Raymond Leung of Isle decided the casino would also jump on board for the project, offering their 700-seat events center free of charge for the event. Leung said he was totally sold on the idea when he saw the list of musicians willing to donate their time and talent to the cause. “I was really blown away by the obvious support of all these musicians for the cause,” he commented. The event is scheduled for Saturday, July 8 from 11 a.m. to 11 p.m. at the casino’s events center. Arm bracelets will be sold for the event, allowing people to come see as many bands as they want, and yet have the flexibility to enjoy food and drink at the casino. Scheduled to appear at the event are Jerra Ingle, Jordynn LaChance, ELB, Item 9, Alex Riffle and the Stiff Riffs, Russell Stover, John Galbraith Trio, Aimee Marie McGoveran, Keith Fletcher, The Millstones, Ben Becker, Dr. Fever and the Venus Flytrap, and The Brothers Walker. The genres of music represented will range from folk, to country, to pop, to rock. Several of the bands are driving long distances to get to the event. Several of the musicians, like John Galbraith and Keith Fletcher, are originally from Doniphan, and have become well-known musicians in Columbia, MO. Yet they wanted to return to help their families and friends back home. All of the bands have roots from all over Southern Missouri, which proves how deep those roots run. Fletcher admitted it broke his heart to see the photographs of the flood, seeing so much of the town under water. “If it hurt me like that to see the pictures, I can only imagine how devastating for the people who have lost so much. I count this as an honor and a privilege to get to play for those people, and maybe help out a little,” concluded Fletcher. Stylistically, Fletcher, and Timexx Seabaugh of Dr. Fever and the Venus Flytrap, would seem to have nothing in common. Dr. Fever is the epitome of Funk. Yet, Seabaugh echoed similar sentiments about performing at this event. Seabaugh grew up in the Red Star District of Cape Girardeau, which was frequently flooded by the Mississippi River. Dee Cee Cripps of the Venus Flytrap agreed that the whole band felt compelled to help when they heard about the benefit. “We have to help each other, because you never know when the shoe will be on the other foot and you are one of the people needing help,” explained Cripps. For everyone else involved in making the event a reality, the calling is equally clear. “It is obvious the people of Southeast Missouri have had a heavy loss. For some of them, it has been a total loss of both home and business. Homes are gone. All their worldly goods are gone or damaged, and no amount of emergency funds from the state and federal government can help them recover all they have lost. This benefit is designed to get those people direct help that they cannot get otherwise,” said Davis. Matt Winters of the Ozark Foothills Regional Community Foundation and the Community Foundation of the Ozarks, will help distribute the funds raised to local non-profits in these communities to get people the help they need. The Brothers Walker, Cotie and Clinton, sum it up. “We hear about natural disasters around the world every day, but when something like this hits home, it really hits you hard,” commented Cotie. “We felt like we needed to do something, and then this event came along! This may not have happened to our hometown, Bernie, but we have to remember to always help our neighbors, because you never know when our hometown might be involved in a disaster. And in Southeast Missouri, we help each other out. That is one of the things that keeps us here, because we love that about our home. That kind of care and compassion isn’t found everywhere,” summarized Clinton. So, come July 8, every town in Southeast Missouri should be represented with lots of music lovers who want to help, and have a really good time in the process. Mark your calendars now! Watch for announcements about ticket sales, and find out how you can help by becoming a corporate sponsor or maybe a volunteer at the event. Your neighbors are depending on you.